Tales of the unexpected beauty of Granada have been told a thousand times. None of this is surprising due to the Granada’s Moorish style monuments, streets, squares and fountains and the spectacular Alhambra of Granada on high watching over the entire city. Granada is a city designed for strolling about, discovering narrow streets, and casually taking in the atmosphere and the history while gazing at it’s impressive monuments and particular Moorish architecture. Granada is reputed for it’s beauty, but once you have actually seen it you will not be able to believe how beautiful it is, nor forget it; Granada will seduce you entirely. The Alhambra Palace of Granada, residence of the Nazarit Kings, is a spectacular Arabic palace which combines architecture and nature to create a real paradise on earth. Palaces, gardens, woods, fountains, towers and walls are all brought together perfectly before the splendid backdrop of the Sierra Nevada Mountains to create one of the most beautiful monuments in the world. It is a must-see and one of the most visited monuments in Spain. View over the Alhambra in Granada - Andalusia, Spain. More than 320 days of sun a year and an average temperature of 20c makes Granada’s Tropical Coast an ideal spot. Light winds from North Africa, warm waters of the Mediterranean and the shelter provided by the nearby Sierra Nevada give it Europe’s only subtropical climate. 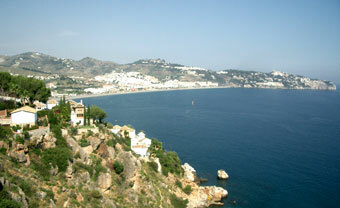 La Herradura, Costa tropical, Granada - Andalusia, Spain. Find your hotel in Granada city now! Sierra nevada is a National Park, a Global Biosphere Reserve (UNESCO) and the ski/snowboard resort of Andalusia. This awesome mountain range, Sierra Nevada, is part of the beautiful natural heritage of Nevada; its higher reaches are covered with snow throughout the year. It was known to the Arabs of the Middle Ages as the Sierra del Sol, as it contains some of the rarest wildflowers in Spain. It can be reached, in less than an hour along a winding road, the highest in Spain, at the famous Pico Veleta. The peaks of the Sierra Nevada are over 9,000ft and the highest, Mulhacen, at over 11,000ft is the highest in Spain. (Ben Nevis is only some 3,000ft). It is an ideal location for active mountain and snow sports holidays, specifically at Andalucia’s only ski-station, in the municipal term of Monachil. It is Europe's southernmost ski resort which offers the most hours of sun and daylight to enjoy your snow fun to the fullest. Throughout the area active sports, like hiking, mountain-biking, horse riding, climbing, caving, rafting and ravining, can also be enjoyed. Yet on the other side of the mountains the Mediterranean coast delivers relaxing beaches, refreshing waters and a bright serene blue sky with flecks of white cloud. A place not to miss. Alpujarra mountain range, some thirty miles from Granada city and 25 miles from the Tropical Coast, is as much part of Granada as it is of Almeria province. It is well known for the beauty and peacefulness of its white towns; its mountain landscapes, the house balconies full of flowers; its friendly people and the atmosphere they create - and most importantly – the spectacular backcloth of the Sierra Nevada. All of these attributes led to it being designated a Global Biosphere Reserve by UNESCO, as well as a national park and a nature reserve, especially for its native flowers and distinctive ecosystems. 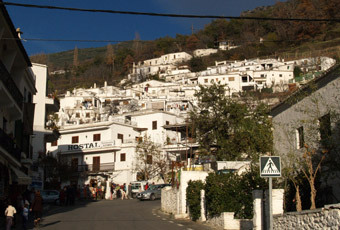 The history of Alpujarra is almost as important because it was the last refuge of the Arabs in Andalucia. 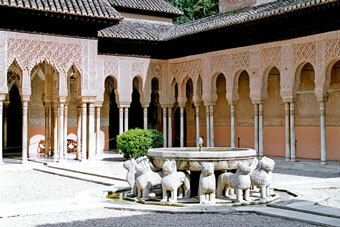 It was here that Boabdil, the last Moorish king, lived for some months after the Christians captured Granada. And, it was to the Alpujarra that the Moors, who refused to convert to Christianity, fled and found refuge during almost a century before they were finally expelled.